For years, there’s been a massive argument between car enthusiasts about which alternative fuel tech is the going to be the way of the future — hydrogen or electrification? To answer that question, Mercedes-Benz thought, why not both? BMW has been developing both separately for some time now, with a few hydrogen vehicles and even more electric cars. However, Mercedes-Benz is currently developing a single car that has both technologies in it. 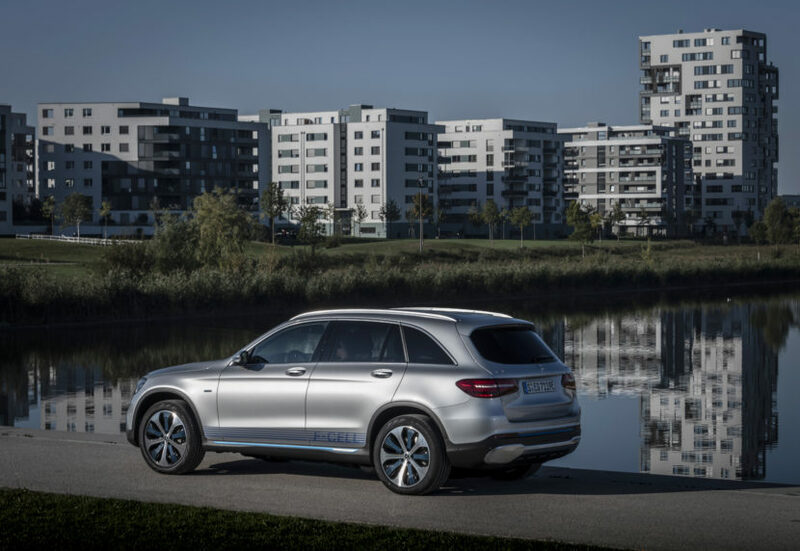 A hydrogen-powered plug-in hybrid Mercedes-Benz GLC-Class, dubbed the GLC F-Cell. Weird. This new Mercedes-Benz GLC F-Cell will actually go on sale at the end of this month, in select cities such as Stuttgart, Munich, Hamburg, Berlin and Dusseldorf. So it’s a real-deal production car and not just some zany concept to grab headlines. What’s fascinating about it is that it’s going to be a plug-in hybrid that doesn’t burn an ounce of gasoline. It will have a hydrogen fuel cell with a 4.4 kg tank up front under the hood, as well as a 13.5 kWh lithium-ion battery pack. Both of which serve as power sources for the 208 hp electric motor at the rear axle. Under full hybrid power, using both the hydrogen fuel cell and the battery, the F-Cell is capable of 297 miles of range, with 31 miles of pure battery-electric range. Obviously, the hydrogen tank can be refilled in minutes, much like a gasoline-powered car, but the battery only takes about 1.5 hours to charge from 10-100 percent from a standard wall charger. There are four different driving modes; Hybrid, which uses both power sources in full; F-Cell, which uses only the hydrogen fuel cell; Battery, which runs entirely on electricity; and Charge, which aims at recharging the battery more than anything else. The latter is likely to use some of the hydrogen fuel to charge the battery as well, much like a normal plug-in hybrid would. This is an interesting car, as it combines both major alternative fuel technologies. However, I’m struggling to see the point. Why not just ditch the battery pack and make it a proper hydrogen-powered car with an even larger fuel cell and more range? Mercedes-Benz already has an electric GLC-Class coming, the EQC, so why make a hydrogen hybrid, rather than just a hydrogen car? I don’t really see the point in having both but it’s still an interesting exercise in alternative fuel. It also shows that BMW is not alone in continuing to look into hydrogen power. Brands like Tesla have dismissed hydrogen as inferior to pure battery electric cars (as if hydrogen might be bad for Tesla’s business #sarcasmfont) but several other major brands are continuing to pursue it, such as BMW, Toyota, Honda and, obviously, Mercedes-Benz. It will be interesting to see if more projects like the GLC F-Cell continue to pop up.